This entry was posted on October 10, 2014 by Allison Holland. 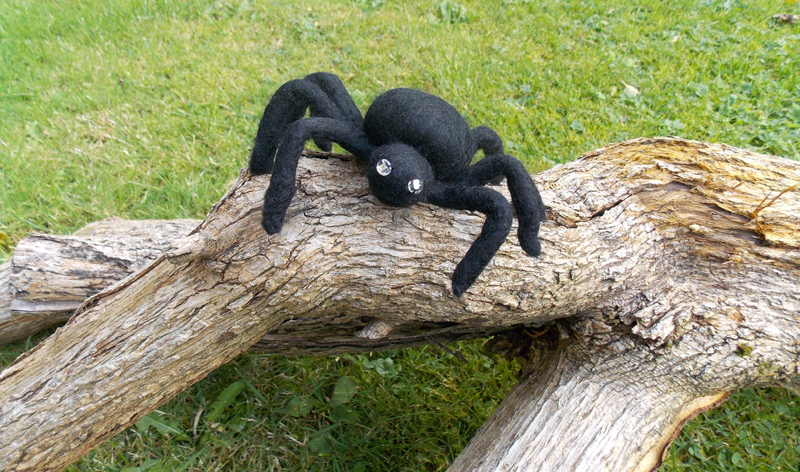 Our spider is made with felted Merino wool tops. The wool tops are rubbed, rolled and agitated with soap and water until the wool fibres mat together to create a dense fabric. 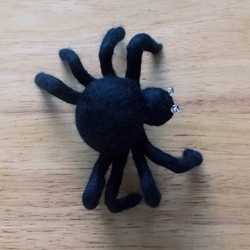 The spider's legs are made from pipe cleaners covered in wool tops. 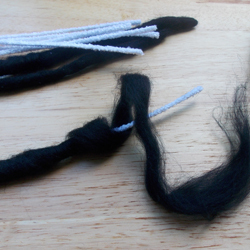 Pull wisps of the wool fibre from the roving and wrap along the length of the pipe cleaner. To ensure even coverage, additional layers of wool can be added as you felt. Spraying a solution of washing up liquid diluted in water is a good way to dampen the fibres ready for felting. Roll the wool covered pipe cleaner between your palms in the same way you would roll modelling clay to make a worm. 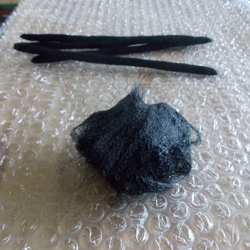 When the fibres begin to felt, place it on to bubble wrap and continue rolling rapidly until all the fibre has felted. 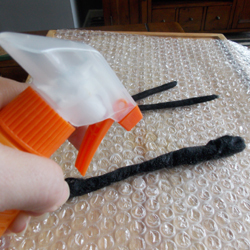 When you have covered four pipe cleaners, rinse out the soap and squeeze out excess water by rolling between your palms. Then roll the legs on a t-towel to help dry them and to further compact the surface of the felt. For the body, roll a length of cling film into a ball. 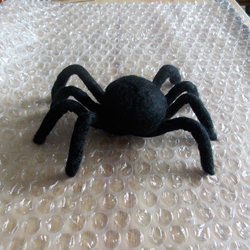 Cover the cling film ball with a loose layer of wool and dampen with a spray from the soap solution. Slowly and gently roll the prepared ball between your palms. 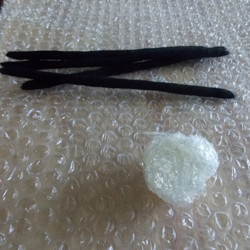 Stop to reposition fibres that have slipped off the cling film core or add more fibre to increase the size of the ball. Increase the pressure as the fibres begin to felt. The shape of the ball is dictated before the felt begins to harden. Slightly squash the ball to give it a doughnut shape so that the legs can be joined more easily. 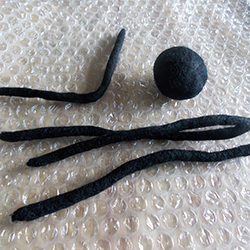 Rinse and dry the ball as you did for the pipe cleaner legs. Find the centre of each leg by bending it in half. Using a long, sharp needle, stitch the legs to one side of the body, taking the thread through the legs, into the body and back through to another leg. 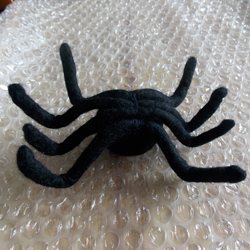 Continue stitching until all the legs are secured. Bend the halves of the legs in half again to make the spider stand. Make a smaller ball (there's no need for a cling film core) and stitch it to the front of the body between a set of legs. Sew on two sparkly beads for his eyes.